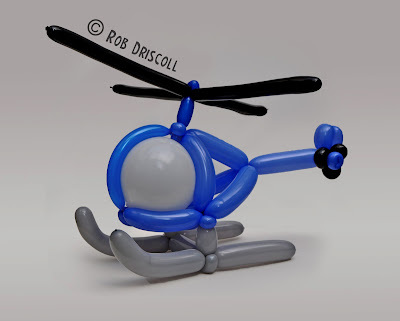 This Helicopter is made from 8 balloons, I started with the framework of the main body with some blue 260s and then added in the round white balloon for the windows (a transparent balloon would have been cool here but I don't have any). The nest step was to add the tail and tail rotor, then I added in the main rotor blades, finally I made the landing struts for it to sit on. Rob can make sculptures for any event, birthdays, anniversaries, get well soon, baby showers, window displays, corporate events and so much more, you can contact him on 07763464628 or robbieaibm@live.co.uk for more information.